Dr Aaron Petersen is a senior lecturer in exercise physiology in the College of Sport and Exercise Science. Aaron's first notable scientific achievement was awarded to him at age 11, when he received the Te Aroha Primary School prize for science. Many years later Dr Petersen obtained his PhD in Exercise Physiology at Victoria University. 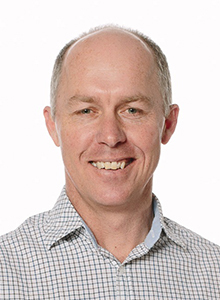 He also undertook post-doctoral training at Deakin University investigating the effects of exercise and diet on skeletal muscle signalling pathways. His research interests include muscle adaptation to exercise training and the benefits of exercise in ageing and disease. Additionally, Aaron is interested in the molecular mechanisms and signalling pathways involved in adaptation to exercise and strategies to enhance the adaptive response. He has a particular interest in heat stress and heat shock proteins. Inness MWH, Billaut F, Walker EJ, Petersen AC, Sweeting AJ, Aughey RJ. Heavy Resistance training in hypoxia enhances 1RM squat performance. Frontiers in Physiology (In Press). Perry BD, Wyckelsma VL, Murphy RM, Steward C, Anderson M, Levinger I, Petersen AC, and McKenna MJ (2016). Dissociation between short-term unloading and resistance training effects on skeletal muscle Na+,K+-ATPase, muscle function and fatigue in humans. Journal of Applied Physiology 121(5):1074-1086. Broatch JR, Petersen AC, Bishop DJ (2014). Postexercise cold-water immersion benefits are not greater than the placebo effect. Medicine and Science in Sports and Exercise, 46(11): 2139-47. Petersen AC, McKenna MJ, Medved I, Murphy KT, Brown MJ, Della Gatta P and Cameron-Smith D (2012). Infusion with the antioxidant N-acetylcysteine attenuates early adaptive responses to exercise in human skeletal muscle. Acta Physiologica 204(3): 382-92. View more of Aaron's publications in VU's Research Repository. Aaron is the principal supervisor for two PhD students, one masters student, three honours students and four internship students. He is also co-supervisor for three PhD students. Dr Petersen has been the lead investigator on government and industry grants totalling more than $350,000. Effects of cryotherapy on recovery following resistance training. The Pratt Foundation. HEAT: Heat effects on adaptations to resistance training. Australian Sports Commission. Effects of cold compression wrap application on muscle repair. United Pacific Industries Ltd.
Coming in from the cold: is cold or heat application better for muscle repair? Australian Sports Commission.